Caution: Read both Hourglass and Timepiece before proceeding. 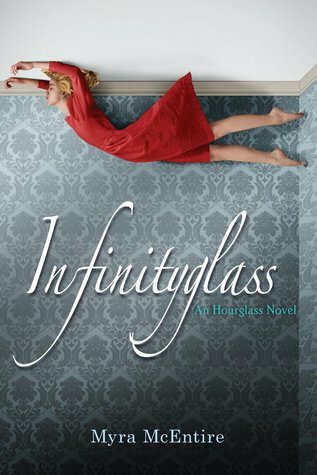 This post focuses on Infinityglass, the third and final book in Myra McEntire’s Hourglass series, and I promise there will be spoilers for those who are not caught up…and maybe some for those who are. So…I finally made the time to finish the fantastic Hourglass trilogy this week, and this final book totally delivered. Infinityglass continues the intriguing story introduced in the first book, but it keeps things fresh with two all new narrators. In this book, readers see events through the eyes of Dune, a vital part of the Hourglass organization with his own tragic past, and Hallie, a sheltered girl with the potential to change everything. The Infinityglass is not a what. It’s a who. More specifically, the Infinityglass is Hallie, a girl living in virtual isolation in New Orleans. Her only escapes come through dance and in the missions she takes on for Chronos, the secretive organization founded by her parents and the more nefarious counterpart of the Hourglass. Hallie has always possessed the ability to manipulate her cells–transmutation, regeneration, etc.–but lately, things are becoming more intense. Her energy levels are off the charts, she no longer needs to eat or sleep, and she’s being pulled into the increasingly common rips in time. Her only real help in determining what’s going on comes from Dune, an Hourglass member posing as her new bodyguard. Dune, Hallie, and the other members of the Hourglass are quickly approaching a showdown with those who started this mess, and none of them are truly prepared for what will be revealed…or who is really pulling the strings. But can these young people, all of whom have very special abilities, work together to defeat the evil among them and repair the damage done to time itself? What will Hallie, the Infinityglass, have to do–or sacrifice–to heal time? Do she and Dune have any hope of a future together when the past and present are trying so hard to tear them apart? I must say that Infinityglass is a very satisfying, if somewhat confusing, end to this wonderful trilogy. I didn’t always fully grasp what was happening with the ripples in time, but that’s okay. Confusion is often a given when you’re dealing with time, and this entire series made me feel like I was watching an episode or two of Doctor Who (arguably the greatest show in all of time and space). Both the Hourglass trilogy and the good Doctor make me think, and that’s never a bad thing. The relationship between Dune and Hallie was probably the highlight of this book. Dune was a good guy, a self-professed geek who worked to overcome his own issues with his abilities, and he was a perfect match for Hallie, a sheltered girl who took every chance she had to escape her suffocating existence. Eventually, Hallie came to realize that no matter how scandalous she acted or what she said, Dune would always be there for her. That gave her a freedom to be her true self that she never had before. Similarly, Dune was able to let down his guard and reveal his deepest secrets and fears to Hallie. In a complicated quest for truth, Dune and Hallie found each other and a connection that transcended all of the chaos around them. To wrap things up with the Hourglass series, I just have to say that if you’re looking for a series that combines romance, teen angst, unexpected humor, and all of the “wibbly-wobbly, timey-wimey” goodness of Doctor Who, then this is the trilogy for you. I hope you enjoy seeing how Michael and Emerson, Kaleb and Lily, and Dune and Hallie work to build their relationships while dealing with their abilities and what they mean for the circumstances at hand. It’s a pretty wild ride, but it’s one that I think you’ll like. I know I did. For more information on Infinityglass, the other Hourglass novels, and Myra McEntire, check out the author’s website, Goodreads, and Twitter. Have fun! Spoilers ahead! If you haven’t already read Hourglass by Myra McEntire, stop right here. This post is all about the second book in the series, Timepiece, and I will definitely spoil the first book for you if you keep reading. You’ve been warned! Sometimes, second books in series leave much to be desired. They often seem like filler until we make it to the big finale. 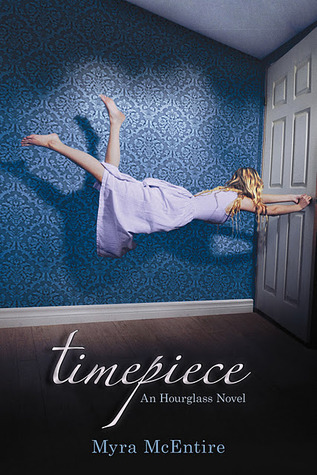 I’m happy to say that I didn’t feel that way with Timepiece, the second book in Myra McEntire’s Hourglass series. Yes, a lot happened that carried over from the first book, and that stuff will likely be resolved in book three, but Timepiece, thanks largely to an entirely new narrator, felt like a book with its own important story. Kaleb Ballard may seem sure of himself on the outside–kind of cocky, tattoos and piercings to emphasize his tough-guy image–but he’s really a whirling mess of self-doubt. His ability to feel the emotions of others makes him seek numbness at the bottom of a bottle, but circumstances are unfolding that will require Kaleb to maintain laser-like focus. Jack Landers, the very man who attempted to destroy Liam, Kaleb’s father, and took his mother’s memories is back once more, and now the stakes are even higher. It’s made perfectly clear that Jack, the fiend who is ripping time apart, must be stopped before he can inflict anymore pain. Kaleb want to do his part to bring Jack to justice. Kaleb’s dad, though, wants to keep Kaleb out of this fight. Liam confides in Michael and seeks out his assistance, and that grates on Kaleb. Why can’t his dad trust him with everything that’s going on? Is he that much of a disappointment? Surely there’s something Kaleb can do to prove to his father that he can help in finding Jack and fixing whatever damage has been done to the splintering space-time continuum. Soon enough, Kaleb finds himself embroiled in the quest to find the elusive Jack Landers. He’s not alone, though. He receives support from Michael, Emerson, and, oddly enough, from Emerson’s best friend, Lily (who has her own supernatural abilities). Not too long ago, Kaleb was plagued with feelings for Emerson, but Lily is changing everything. She doesn’t buy into his bad boy image, and that allows Kaleb to actually be real with a girl for the first time. But it’s hard to build a future with a girl when time itself is unraveling around them. Time is ripping apart all around Kaleb and his friends. If they don’t do something fast–find some way to stop Jack in his mad dash for power–everything they know will be torn to shreds. Can they foil Jack’s plans and restore the memories he’s stolen from so many? Or will their search for truth put them in even more danger? Read Timepiece, the thrilling second book in the Hourglass series, to find out! I’m the first to admit that time-travel fiction messes with my head, and Timepiece is no different. It confused the crap out of me, and I have to say that it wasn’t an entirely unpleasant feeling. Anything that makes me think is good in my book. Also, I love the “wibbly-wobbly, timey-wimey” quality of this entire series. It’s all very Doctor Who (which makes sense because the author is a fan of the show). I am a die-hard Whovian myself, so anything that reminds me of The Doctor is simply fantastic. Even though Timepiece had a fair amount of resolution at the end, questions still abound. The final moments of the book indicate that things are going to get much more confusing before any clarity shines through. The search is now on for the mysterious Infinityglass, the one thing that could stop Jack’s machinations and finally repair time once and for all. I’m confident that the search will not be an easy one, and things will get much worse before they get better for Kaleb, Lily, Emerson, and Michael. I can hardly wait to see how everything plays out! Luckily, I don’t have to wait long to see what happens here since Infinityglass, book three in the series, is already out. I’ve just got a few other books to finish, and then I’ll devote some time to wrapping up this intriguing series. For more information on Timepiece, the other Hourglass novels, and Myra McEntire, check out the author’s website, Goodreads, and Twitter. Happy reading! *I should also note that Ms. McEntire was so entertaining that I recommended her as a guest author at the annual conference of the South Carolina Association of School Librarians. Wonder of wonders, she accepted SCASL’s invitation, so I’ll get to see her once again in March! Emerson Cole is not exactly a typical seventeen-year-old girl. In fact, almost nothing about Emerson is what one would consider “normal.” When her name pops up, “crazy” is the word most often used to describe this troubled girl. Michael Weaver, a guy not much older than Emerson herself, works for an organization known as the Hourglass, and he’s been hired by Emerson’s older brother to help her through some of her issues. What her dear brother doesn’t know, however, is that the mysterious Michael hasn’t come into the picture to make Emerson “normal;” he’s here to show Emerson the true depth of her power. Soon after meeting Emerson, Michael explains that her encounters with ghosts are much more than what they seem. They are, in fact, ripples in the fabric of time, and Emerson has the unique ability to actually travel to the past, even change things if she wishes to. Michael wants to help her do just that. Emerson is soon dealing with some fairly unbelievable information, things that make her question everything she thought she knew about herself and the universe. And as if that’s not enough, she’s also confronting some pretty inconvenient feelings for Michael. There’s this weird electrical charge whenever they touch, and their pull toward each other is undeniable, but Michael rebuffs her at every turn. Why? Is it simply because her brother hired Michael to help Emerson? Or are there other things–other people–getting in the way of a possible relationship between Emerson and Michael? As Emerson learns more about herself, her abilities, her past, Michael, and the secretive Hourglass organization, she comes face-to-face with some truths that are at once horrific and seemingly impossible. Does she really have the power to change her fate and that of those around her, or have other forces already manipulated Emerson’s life and abilities to achieve their own ends? Hourglass really puts a different spin on the whole time travel concept, and it’s one that I think a lot of readers will enjoy. There’s way too much time travel fiction out there that just glosses over the physics behind the concept. This book doesn’t do that. It actually takes a look at things like the space-time continuum and how changing one thing in the past could have devastating consequences in the present and future. The science nerd within me is rejoicing over this…and trying to decipher what the book’s conclusion could mean for time itself. Aside from all of the time travel stuff, Hourglass has a flawed, totally relatable protagonist. Emerson is far from perfect. She has huge errors in judgement all the time, but I truly believe that her heart is in the right place. She wants to do the right thing, but it’s not always clear how to do that. And when she finds herself floundering, she does what so many YA characters don’t–she talks to the adults in her life, tells them the truth about her situation, and listens to (even if she doesn’t always follow) their advice. Also, she’s like a mini-ninja, so that makes me like her even more. So, we’ve got time travel, and we’ve got a likable main character. What am I forgetting? Oh yeah! The totally infuriating (in a good way) love story! The push-pull between Emerson and Michael was both wonderful and exasperating. Every time I thought they were about to confess their feelings for each other, I was thrown for a loop. (So was Emerson, by the way.) I didn’t know which way to turn, or even which way I wanted to turn. And when another swoon-worthy guy entered the picture, I was even more confused. Who should Emerson really be with? Should she be with anyone? It’s all very confusing…for both Emerson and the reader. And the book’s resolution, while it does kind of resolve this one big thing, also makes it clear that Emerson’s immediate future will likely be anything but moonlight and roses. 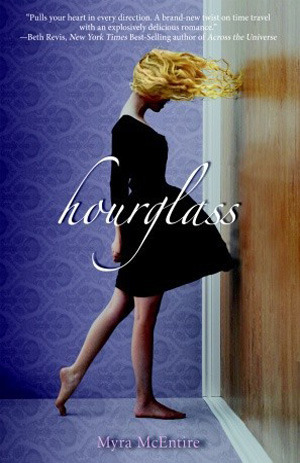 If you’re looking for a riveting YA read, I urge you to give Hourglass a try. I hope you enjoy it as much as I did. For more information on Hourglass, its sequels, and Myra McEntire, check out the author’s website, Goodreads, and Twitter. Ms. McEntire is also a contributing author in the holiday anthology My True Love Gave to Me, so you may want to give that fabulous book a read as well! Well, Nicole may have stumbled across something that could work. It’s something that no one has tried for centuries. Chronoportation. In other words, time travel. It’s dangerous and highly illegal, but this power could be just what she needs to undo her mistakes. She’ll need to travel to the palaces of Zeus, Poseidon, and Hades, and contact her godly ancestor to make this happen, but Nicole is determined to right her wrongs and bring her parents back where they belong. But things may not be quite as simple as Nicole had hoped. (They never are when in comes to Greek deities!) Nicole will come face-to-face with her own past on this journey, and she may not be totally prepared for what she finds. What will Nicole learn about her heritage and, more importantly, about herself in this quest for justice? 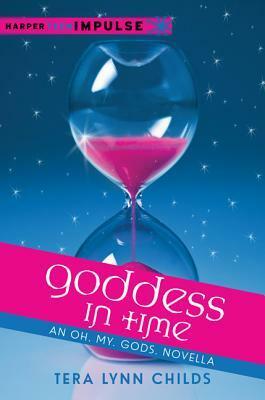 Discover Nicole’s secrets when you read Goddess in Time, an Oh. My. Gods. novella by Tera Lynn Childs! If you want even more stories from the Oh. My. Gods. series, check out Tera Lynn Childs’ website at http://teralynnchilds.com/. There are three more really short, sweet stories right there on the site: Phoebe’s Fair Valentine, The Twelve Days of Stella, and Nicole’s Labyrinth. I read them all last night, and, from what I could determine, all of them take place after Goddess Boot Camp but before Goddess in Time. Enjoy! After Michele receives an mysterious key and finds an old diary, she is somehow transported from 2010 to 1910. Michele can only be seen by certain people in her travels through time…and one of them will totally capture her heart. Philip Walker is just as enraptured by Michele as she is by him. But how can their love exist when neither belongs in the other’s time? Is there a way? And what force is allowing Michele to travel through time anyway? What family secrets will Michele uncover on her journeys, and can she find a way to stay with the love of her life? Read Timeless by Alexandra Monir to discover that real love can cross all boundaries…even time itself. If you think you’d enjoy Timeless as much as I did, I invite you to check it out. You can also look forward to more of Michele’s story in the sequel, Timekeeper, due out in December 2012. 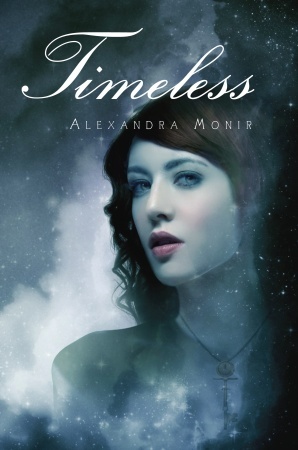 To learn more about Timeless and author Alexandra Monir, visit http://www.alexandramonir.com/. You can even download some of the music featured in Timeless! Pretty cool! I put off reading Torn for a while simply because I wasn’t a huge fan of Sent and Sabotaged, and I knew I would be in for more of the same in the fourth installment. 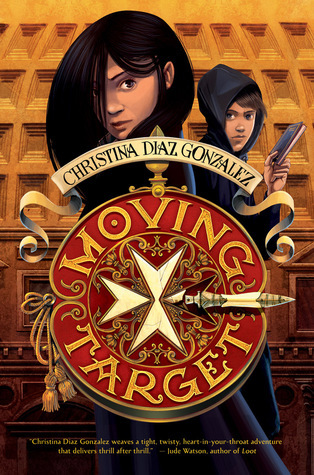 In this series, Haddix combines elements of historical fiction and time travel. In essence, the series revolves around the missing children from history and the struggle to return them to their places and “fix time.” We were introduced to this story line in Found; in Sent, we traveled to England in the time of Richard III; in Sabotaged, we journeyed to the lost Jamestown colony with Virginia Dare; and in Torn, we make our way to the icy waters around northernCanada with the notable explorer Henry Hudson. It should go without saying that I wasn’t a huge fan of this book. I have issues with time travel, and I’m not one to read much historical fiction (despite my previous life as a social studies teacher). I did, however, appreciate the lengthy author’s note which detailed how much of this book (a lot) was based on fact. I don’t even know where to begin when it comes to the book I finished yesterday, Ransom Riggs’ Miss Peregrine’s Home for Peculiar Children. It was weird, creepy, and it messed with my head. For the most part, I avoided reading it at night because I didn’t want to have nightmares. (I think I’ve established in earlier posts that I am a wuss of the highest order.) The photos (which are totally real) interspersed throughout the book moved the story along, but most of them also gave me a serious case of the willies. Miss Peregrine’s Home for Peculiar Children is unlike any book I’ve ever read, and I have a feeling you’ll feel the same way if you decide to pick it up. Jacob has always known that his grandfather, Abraham, was a little “out there.” Abe was always making up stories about children with strange abilities, and he talked about fighting monsters in the past. When Jacob was a kid, he accepted these stories as absolute truth, but, as he grew older, he came to believe that his grandfather was just telling tall tales. As it turns out, however, Abe might have been telling the truth. When Abe is killed in a horrifying and gruesome manner, Jacob comes face to face with his grandfather’s mysterious past…a past that centers around a home for “special” children and their caretaker, Miss Peregrine. Jacob then makes a long journey to find the place that meant so much to his grandfather…and hopefully find the truth behind the stories and photos Abe left behind. As Jacob explores the isolated island in Wales where Miss Peregrine’s home is supposed to be, he comes across some strange things…a house that is in ruins one minute and pristine the next, kids dressed in clothes that seem to be right out of a history book, seemingly impossible feats, and a connection to the girl who once loved his grandfather. Jacob travels through time itself to uncover the mystery surrounding his grandfather’s death, and he soon realizes that he and the people he’s coming to care about may be facing an even greater threat…a threat that could wipe out their very existence. But what can he do? There’s nothing special about him…or is there? Could he have the same “gift” as his grandfather? Is he one of the “peculiar children” too? Join Jacob and a motley crew of outcasts from Miss Peregrine’s Home for Peculiar Children as they fight an evil that could destroy everything they hold dear. Mere words cannot express just how creepy this book really is. This is definitely one you need to see for yourself. The photos alone are worth picking up this book. I found myself anticipating which strange photograph I’d be seeing next and how it would play into Jacob’s story. And even though I’m not usually a fan of time travel fiction, it worked in this book…and, even better, the photos made it even seem plausible. (I know it’s weird, but work with me here.) I look forward to seeing more in the next book in this series (which is currently untitled and due out in 2013). I know we’ll find more creepiness to enjoy! If you’d like to learn more about author Ransom Riggs and Miss Peregrine’s Home for Peculiar Children, visit http://www.ransomriggs.com/. You also might like to know that a movie adaptation of this book is in the works with Tim Burton set to direct. What an absolutely perfect pairing!